Flat design is a trend that may be closely follow right now, however as for all trends, they have a life span. No design trend lasts forever as we are on a constant evolution. Just as flat design is trending now, the emergence of long shadow design has been rapidly growing too. If you have been embracing flat and long shadow design, we present you this wonderful freebie – A long shadow flat UI kit created exclusively for ONEXTRAPIXEL by Revolge. The long shadow flat UI kit has been created by Responsive, a Bucharest based design & development studio. Responsive is currently working on Revolge, an online drag & drop design tool for creating stunning WordPress themes. The UI kit is being used for wire-framing the app and they decided to share it for free with the OXP community. For more information about Revolge, you can sign up for the beta on revolge.com. Feel free to use this long shadow flat UI kit for personal or commercial projects but please do not sell, modify, distribute or host them elsewhere whether online or offline. 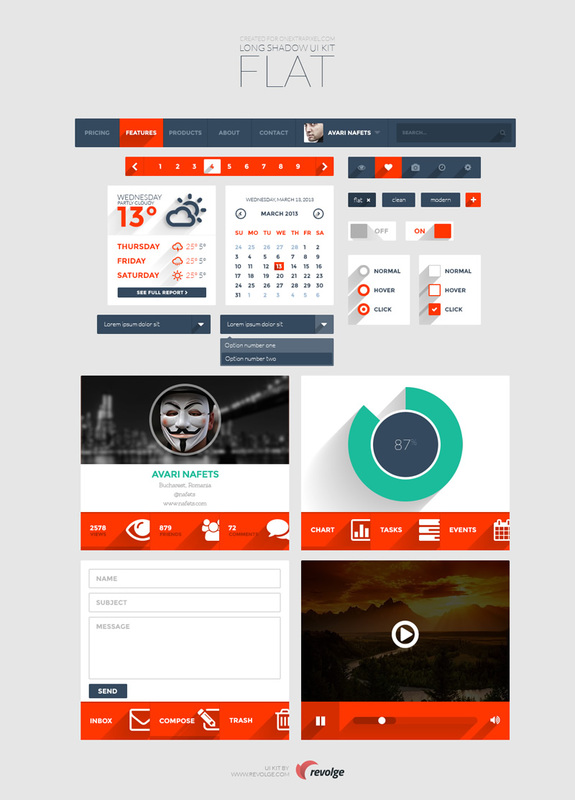 We offer our sincere thanks to Revolge for creating this awesome UI kit and we really appreciate their efforts.